Corned Beef & Dill Pickle Rollups - A recipe from Savor California, the online showcase for extraordinary gourmet foods and beverages from California. Mix cream cheese, garlic salt, Worcestershire sauce, and dill weed. Lay out corned beef slices on bread board. Spread the entire top of corned beef with cream cheese mixture. Place a pickle spear in the middle of each corned beef slice. 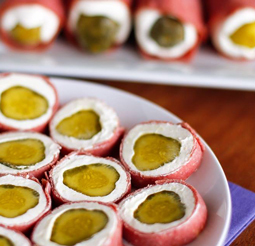 Roll up corned beef over pickles, pushing together as you roll. Place rolls in plastic wrap and refrigerate until cold. Cut thinly with a sharp knife, cover, and keep in the refrigerator until ready to serve.